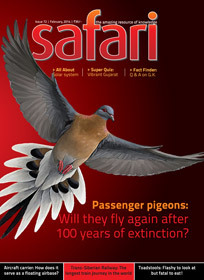 The March 2013 issue of Safari – a science and knowledge magazine from India – have been out and here are our personal unbiased reviews for the same. The cover pages shows the solar system, giving us the hint that we will surely find a detailed article about the same inside. I would like to mention that in a newspaper recently I found an interesting news related to the discovery of a new planet system surprisingly near to us, we may still know a very little about the universe we live in. The megapixel section have a really nice picture of a bird named The Great Hornbill which is found in India, Thailand and Malaysia. Makar Sankranti – is the time when the Sun enters into the Makar. Mostly it is on the date 14 January with few exceptions. The day is considered important spiritually also. The day is remembered more for something else as well. Probably the biggest kite flying in a region takes place on the day. India and especially Gujarat is known for having people flying the kites on this day. Kite flying is a really great thing when enjoyed with safety measures, it can prove fatal otherwise. However it proves fatal for birds after even taking a lot of safety majors as well. The deadly threads of the flying kites give the affected bird, the death which is horrible. A lot of environment savvy people runs free helplines for injured birds during the period as well. But do you know that there are more such incidents where we humans prove fatal for other species? Read a 3 page article in this issue to know about the same. Followed by is the article titled – Extra – solar planets: The bizarre world outside our solar system which is incorporated with few nice images and superb graphics. With the technological advancements the other planets and solar systems are more within our reach then ever before. Though our search for Earth like planet where we can find the traces of the life in the form we expect to see, is not ending. The extra-terrestrial stuff always fascinates most of us and hence the article proves interesting read. This very detailed article brings us the information about the following 7 exoplanets. WASP-17B: The Gargantuan exoplanet having density of foam coffee cups! PSRJ1719-1438b: The exoplanet made of diamond! CoRoT-7b: Helish exoplanet where it rains rocks! HD 80606b: The “hot-headed” exoplanet. Fomalhaut b: The coldest exoplanet discovered till date. HD 188753: One planet, three Suns! TrES-2b: The exoplanet darker than coal! Ducks and drakes: The sill and science of skipping stones on water – is an article which focuses on the science behind the game of ducks and drakes. It will be fascinating to know that this scientific knowledge even used in a war to destroy a dam and hence affecting the atom-bomb project as well! Read the article and you will find that the game is interesting and so does the science! In Fast Facts segment – there comes the information about Metro railway. Who have considered the ants as deadly and fatal insect?! But the drivers ants of Africa really are!! They can not prove only fatal but can cause the horrible and extremely painful death! Don’t ever caught by them. Read detailed article implanted with facts by D. N, Kaushik to know more about this species. Is it a mere conincidence that Polaris (North Star) is almost directly above the North Pole, or is there more to it? Where did all the water in today’s oceans come from? Wat is its total volume? How do meteorologist measure and record wind speed? Was there ever a real blood-thirsty Dracula, as depicted in horror stories and Hollywood movies? Major constituent of human body by weight is water. Where does this H2O reside? When did human beings discover fire as a source of energy? With the Global Positioning System/GPS always there to thelp the ships to get their navigational fix, why do we still need the lighthouses? What is the lowest possible temperature at which a substance can be cooled? How many stars are there in the universe? Have astronomers made an educated guess? To achieve the same amount of lifting power, why a hot air balloon has to be much bigger than a helium balloon? Are black holes forever or they have a sort of expiry date which they will cease to exist? The super quiz section of this month’s issue focuses on The Domesticated cattle. And the last cover page have the All about – Futuristic steam car, which is a very good article indeed. Overall the articles are balanced in various knowledge segment and making it a worth read. The good thing is rather than giving overview of many points via small articles the magazine is weaved with detailed articles about less topics – which is in fact good. So for those who starve for the knowledge, this issue is not to be missed.